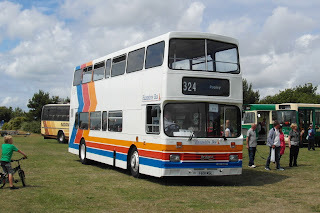 Welcome to the blog which has been bringing you news, views, photos and more from the Southern England Bus Scene since 2010. Please feel free to get in touch or leave a comment. What an enjoyable day out on the South Coast yesterday was. 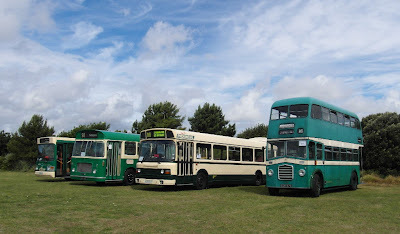 Today's post gives some of the highlights of the 2013 Stokes Bay rally, organised by the Provincial Society and supported by large numbers of bus owners, stall holders and visitors. The sun came out from behind the clouds more and more as the day went on, and it was a really lovely day. Just one quick piece of housekeeping - to reminisce over the last rally in 2011, please click here. 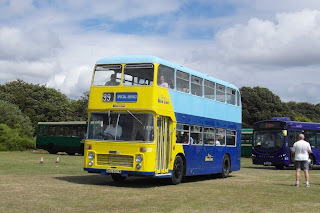 I'll start with a line up of preserved Provincial buses, as the rally was started in 2003 originally to support 125 years of the company. From left to right are unique ACE Cougar H523CTR, Bristol RE ECG112K, Leyland National A301KJT, and Guy Arab II EOR875. 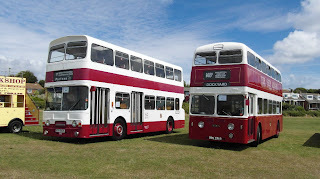 There are a wide selection of Provincial vehicles preserved and I've always wondered why - especially when some former fleets do not have any buses preserved. This preservation of history is perhaps why my local fleet is so fascinating - the history seems to effortlessly live on into the present day. 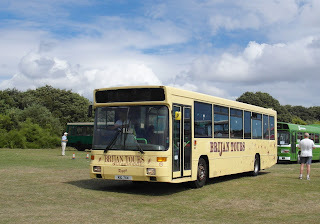 Secondly, Brijan Tours, who also sent a large number of buses, including three Darts and this Volvo B10M - affectionately known as Reggie - and formerly N502HWY. Without the support of Brijan, the rally would not be able to take place, so thank you very much - it is very much appreciated! The local southern fleets were well supported, with various buses from the Go Ahead South fleets or their previous incarnations. Here is preserved Solent Blue Line VR NDL637M heading out of Stokes Bay on the cavalcade. Sister Go Ahead company Brighton & Hove brought one of their brand new Volvo B9TL/Wright Eclipse Gemini 2 double deckers for route 5. This is 470, interestingly registered BK13OAP. Stagecoach were well supported with a Volvo B10M and this, an early Leyland Olympian new to Hampshire Bus. 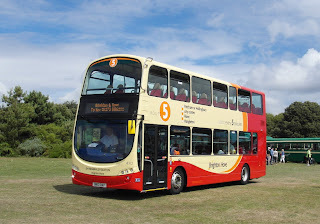 F601MSL is still owned by Stagecoach, and is one of an ever increasing number of preserved buses owned and operated by Stagecoach internally - an excellent initiative which recognises the service these buses have given in the history of the company. Still numbered 14951 in the Stagecoach fleet, here she enters the rally site having completed one of the free tours around the south coast. 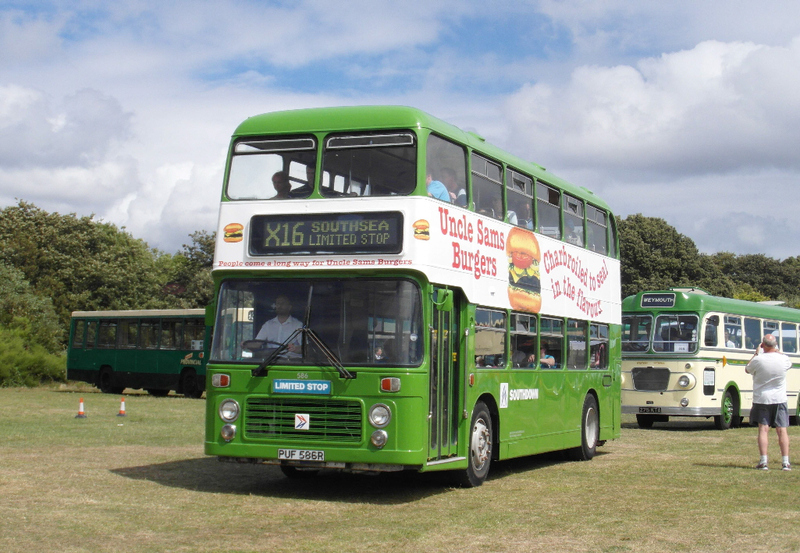 Preserved Southdown buses also featured frequently at the rally - here is PUF586R with the destination set for the old X16 express service to Southsea. She is pictured heading out on the cavalcade. Sticking with Southdown and also veering slightly left to Hants & Dorset, here are two well known and loved buses passing each other at the entrance to the Stokes Bay rally site. Hants & Dorset 5677EL heads out onto the cavalcade, while Southdown PRX189B deposits passengers from one of the free tours. The dedication shown by the owners of all the preserved buses must be applauded as all buses were turned out looking spotless. In addition, without the support of these preservationists, rallies like Stokes Bay would not take place, so it is much appreciated! 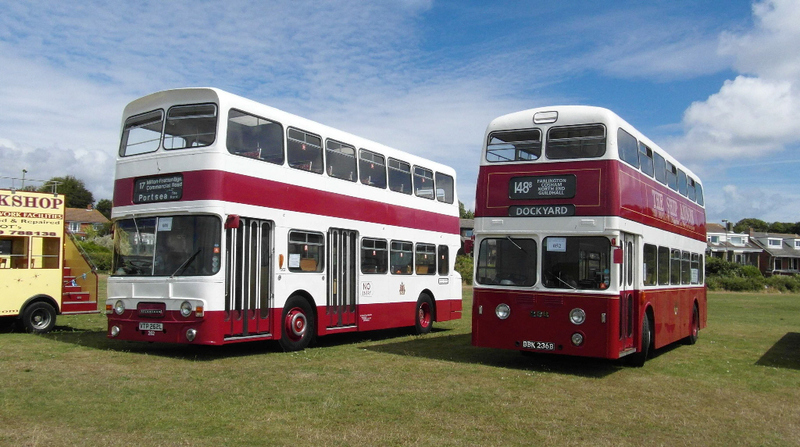 Two further glorious buses - this time from Portsmouth. 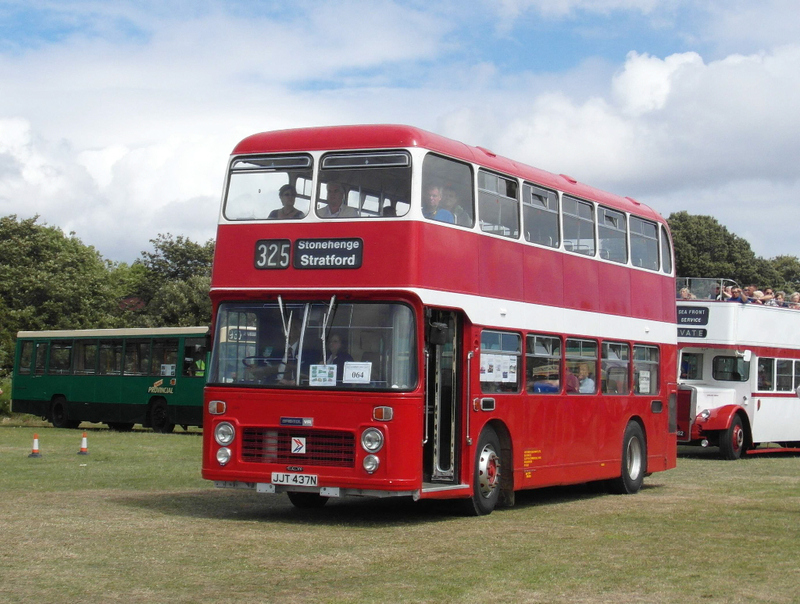 Atlantean VTP262L is blinded up for route 17, alongside BBK236B on the 148B route. Suddenly, you can see the benefits of First's simple network in Portsmouth today! 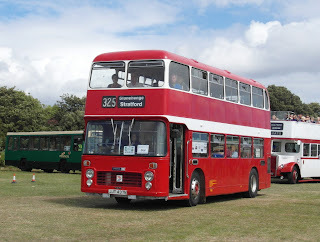 Finally, this is preserved Wilts & Dorset Bristol VR JJT437N. This is the first time that I've seen this bus, and I was very excited to see it pull into the rally site in the morning. It is pictured heading out of the rally site onto the cavalcade. Yesterday's rally was well attended with visitors, buses and traders. It seemed all the stronger for missing out a year earlier, due to the consistent and persistent heavy rain suffered in 2012. Yesterday, the sun was out, the buses were rolling, and it was almost like it had never been away. Thank you to all of those individuals - the Provincial Society, officials at First & Brijan, preservationists, traders and enthusiasts themselves - who made the day so successful and enjoyable. Here's to next year! 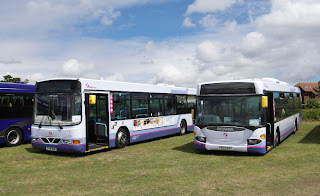 Lovely photos bus80d or can I call you James or Sir. I was there, wish we could have met up and chatted face-to-face. Great photos, thanks for sharing. Here at Queens Hotel Portsmouth we offer luxurious accommodation together with superb views across the Solent and exceptional attractions such as Portsmouth Historic Dockyard and Mary Rose Museum. We wish you and all your readers a great summer. Welcome To Southern England Bus Scene! 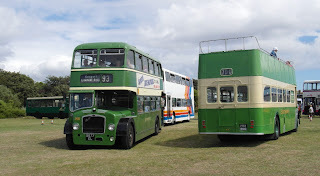 Welcome to the Southern England Bus Scene blog! This is a new blog, started on 6th September 2010, bringing you information, insight, photographs and enthusiast ramblings from Southern England. Although my scope is the whole of Southern England, in reality this blog will focus on Hampshire and its surrounding counties. I hope you enjoy this blog - please feel free to get in contact or comment as you wish. Regards to all. All Time Views since 6th September 2010 - Thank you for your support.